We undertake house clearance in all areas of Newcastle: North Shields Prudhoe Riding Mill Rowlands Gill South Shields Stocksfield Wallsend. A 200-year-old love letter, written in French, has been discovered in one of the items found during a house clearance. 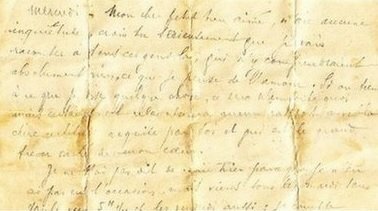 The letter – which was discovered by upholsterers in Newcastle, in the arm of an old chair – is said to have been written by a man residing in Mercurol, in the French Alps. The names of each respective person are unknown; however the previous owner of the chair, Georgina Mucklow-Davis, said she bought it from a house belonging to a French family – who had lived there for some 150 years. It is thought Mucklow-Davis has written to the house’s residents in a bid to find out whom the letter was intended for. Graham Simpson, the owner of the upholstering firm wherein the letter was uncovered, spoke to BBC News about the find.